HAMDEN, Conn., Mar. 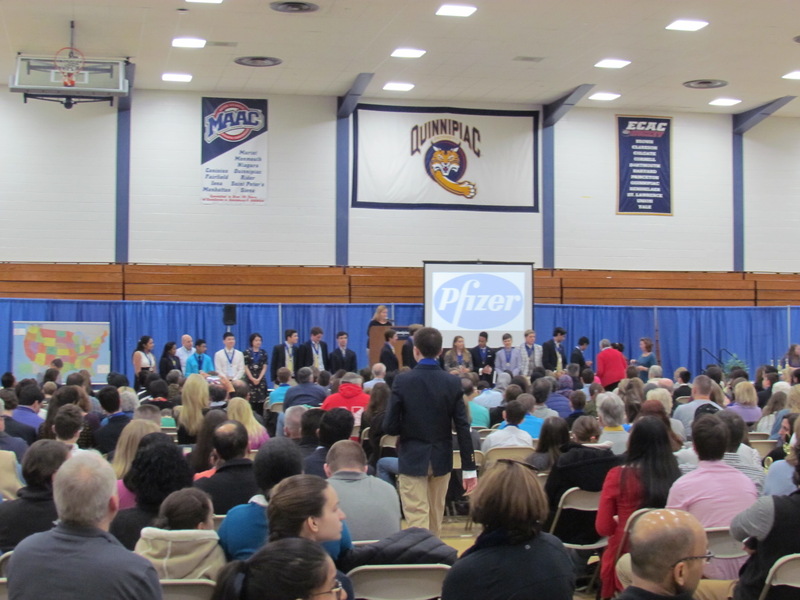 18, 2017 – Students from across the Nutmeg state won awards at the Connecticut Science & Engineering Fair (CSEF) during Saturday’s ceremony at Quinnipiac University. The individual high school physical (PepsiCo) and life science (Pfizer) winners, as well as the CASE Urban School Challenge, UTAS Engineering and Alexion Biotechnology winners, listed below, will all go to the prestigious Intel International Science & Engineering Fair, to be held this May in Los Angeles, California. However this year an exciting finalist situation arose for the prestigious Intel International Science & Engineering Fair representation in the life sciences engineering and CASE Urban School Challenged categories. 1st place Shobhita Sunaram had already won a trip to the ISEF fair earlier in the year from the CT-STEM fair. 2nd place Sophie Edelstein also won a trip to ISEF from the Engineering category and 3rd Place Maya Geradi won a trip to ISEF from the CASE Urban School Challenge. Therefore, representing Life Sciences this year at ISEF will be 4th place Luca Barcelo and 5th Place Rahul Subramaniam both from Greenwich High School. Other winners from CSEF will represent Connecticut and compete for millions more in cash and scholarships at competitions including the International Sustainable World Engineering, Energy & Environment Project Olympiad (I-SWEEEP), GENIUS Olympiad, and the Broadcom MASTERS competition. Click HERE for all Fair results, including Special Award winners. All students listed below live in the same town as their school, unless otherwise noted. Green Tea: A Simple Solution for a Bananas Problem? Pharmaceuticals In Our Water: How Can These Hazardous Chemicals Be Filtered?